By 1992, Nintendo was crushing the competition in the handheld market with a piece of handheld hardware that was technically out of date when compared to its main sources of competition. But with a little ingenuity, great battery life, and some serious gameplay, the Game Boy continued to hold its own against the likes of the Sega Game Gear and Atari Lynx. The amount of success was enough to get many companies to take notice, and while some chose to try their hand making games for the beloved grey brick, a few others instead began speculating on how they could get a piece of the action. Enter Watara, a Taiwanese company that figured it could take some of the Game Boy’s potential market if it released a product that was only slightly better in design and cheaper for the consumer to buy. Thus the Watara Supervision was born. But despite the technical improvements on the Game Boy’s design, the low price, the international releases, and the advertising, the Supervision failed to provide the quality of games needed to capture the market. This fatal oversight proved to be its downfall, and the Supervision fell into obscurity, just another machine left on the roadside in Nintendo’s wake. 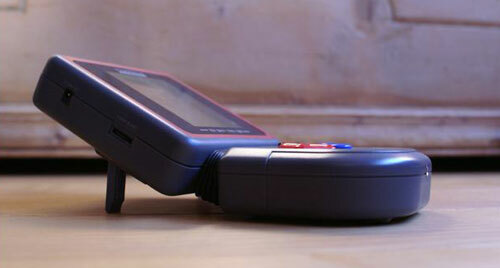 Released in 1992, the Watara Supervision was Watara’s attempt to capture part of the handheld gaming market which was at the time being dominated by the Nintendo Game Boy. Interested in keeping the price low, Watara entered into distribution deals which allowed for the Supervision to be priced at only $49.95, considerably less than Nintendo’s $89.99 Game Boy. Supervision games varied in price from $8.95 to $14.95. Nintendo did begin offering a “Game Boy Basic” package for $59.95 without a game around the time of the Supervision’s release but denied it was in any way related. The Watara Supervision had little third-party support from Japanese and American game developers. Most games were developed in either Hong Kong or Taiwan. Interested in hyping its new machine, Watara began advertising the product heavily on The New Price Is Right. The show failed swiftly. The Supervision was also offered as a prize on the show Legends of the Hidden Temple. While cheaper and intended to one-up the Game Boy, the Supervision ended up failing, just another handheld to fall in Nintendo’s wake. The TV Link is a point in the Supervision’s favor, appearing two years before Nintendo released the Super Game Boy. The Watara Supervision is just another example of a console or handheld failing because of the lack of both third party support and quality games. The Supervision came packaged with the game Crystball, 4 AA batteries, and a set of headphones. There was an alternate packaging that included Classic Casino instead of Crystball. While the unit is similar to the Game Boy, the Supervision’s screen is actually larger, displaying 25600 pixels to the Game Boy’s 23040. The Supervision has the same audio channels as the Game Boy but also included an extra channel for Audio DMA output. Multiplayer is handled via a DB-9 port built into the unit, so the Supervision doesn’t require purchasing a special multiplayer cable. The unit is easy to take apart, so modders and those trying to make repairs can get in relatively easily. The Game Boy AC adapter will work on the Supervision. The most well known model of the Supervision had a bendable midsection to allow the player to adjust the screen’s position. The unit is poorly put together, with some folks finding tape and cellophane inside the units when dismantling them. Many have become damaged over the years and are no longer in working order. The screen suffers from serious motion blur. The D-pad changes with every design, but generally wasn’t considered as good as the Game Boy’s either. The game list is relatively small, tapping out at 65 in the United States, with a few others released around the world. Many of these games were clones of other famous games and were considered to be of lesser quality when compared to the Game Boy’s offerings. Fans of pristine collections will be unhappy to know that North American games came packaged in plastic clamshells, so to open a game means to destroy the packaging. European games came in cardboard boxes. The Supervision is bigger and heavier than the Game Boy. The CPU is an 8-bit WDC 65C02 processor. The Supervision screen is 2.37 inches x 2.37 inches, or 160 pixels x 160 pixels. It uses an LCD that can display 4 monochrome shades. The unit is powered by 4 AA batteries or a 6V AC/DC adapter. The unit includes a cartridge port, contrast dial, and a DB-9 connector port for multiplayer. Sound is handled by 4 tonal and 1 Noise channel plus an additional DMA stereo output channel via the built-in speaker or the headphone jack. Volume is controlled with a dial. The TV Link is a cable that plugs into both the Supervision and the TV Link box, which then plugged directly into the television. The system operates like a rudimentary Super Game Boy, allowing Supervision games to be played on the television. The system even displays the games in color, though it should be noted that it was limited to 4 colors. A Supervision carrying case was also released by Watara. All Supervisions originally came packaged with a set of headphones. 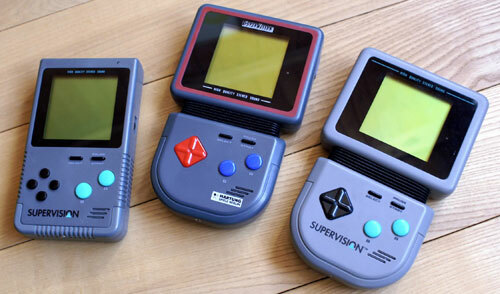 The original appearance of the Watara Supervision was extremely similar to the original Game Boy, even copying the locations of the power switch, headphone jacks, and the volume and contrast knobs. The second version was the primary release in the United States and Canada. It featured a redesigned d-pad and offered a bendable section in the middle, allowing the screen to be set at an angle. Small tabs were included on the back to help hold up the screen if the Supervision was placed on a flat surface. In the UK this version was branded the Quickshot Supervision, but the back tabs were not included. Magnum International also released a version of the Supervision which lost the bendable section and changed the d-pad once again. The location of the start and select buttons was also changed, and the handheld added raised sections to the front. This version was released in grey, green, and yellow. Because of the distribution deals Watara made with companies around the world, the handheld’s name changed, ranging from Supervision to Hypervision to Tiger Boy. It was also released as the Vini Supervision, Videojet Supervision, Audio Sonic Supervision, Hartung Supervision, and more. The Supervision has been emulated via MESS. GoodTools currently has a list of 47 game ROMs for the handheld. Potator is another Supervision emulator, developed by Xport for Windows, GP2X, and the Nintendo DS under the names Watari and PotatorDS. It is believed to be the first Supervision emulator. The final known release is Potator v0.7, but 0.6 is the most commonly found and used. SuperVisionX is a Supervision emulator for the original Xbox built off of Potator. While it isn’t 100% perfect, many games are playable, and the emulator includes many features such as save states, cheats, and other options. 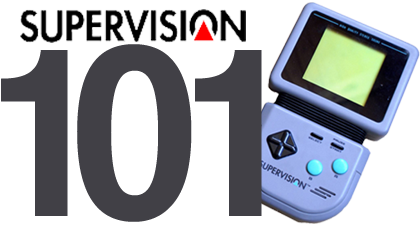 A Supervision emulator for GBA was also released, named Wasabi, but the program was never updated. SuperDCision is a port of Potator v0.6 for the Sega Dreamcast. Syd Bolton’s website on the Supervision contains some great information on the handheld along with information about each game. I had that third version on the right of that picture. Used to play that all the time at recess. I finally sold it like a year or two ago cause the screen was starting to die. Great read as usual Ack! I actually used to daydream about winning one of these on Legend of the Hidden Temple when I was a kid. In my head I imagined them as some sort of super-ultra advanced Game Boy. Great read! I never heard of the Supervision. That is a great feature of hooking up to the TV, maybe this would be the first handheld that had that capability? Wow, I remember these things! I knew a girl in 5th grade that had one of these. I remember seeing these in the stores and wanting one but could never get one. Does anybody know of any emulators for this? I want to see if I can emulate this system on my PSP or Dreamcast lol. That Gamester81! What handhelds does he not own yet? I only ever encountered the first model. I wouldn’t even have known that other models existed. Maybe these were only released in the North American market ? I remember playing only two games for it. Crystball, and another Isometric view platform game reminiscent of Solstice, but closer in looks to “Die Maüs” for Game Boy. Can’t remember the name of that Supervision game though. Hopefully you’ll make an article about Supervision games someday ? I got one of these on Craigslist with 7 games for 25 bucks. Pretty cool little thing. One of the games I got was a shmup I actually really enjoyed called Jaguar Bomber. It wasn’t too challenging but pretty decent and fun for that generation. I recommend it to all who get a supervision. Great information. It is so hard to find any info about any of the games for the WSV. I will continue my search, but for now thanks for the down low and great pics. I look forward to tracking one of these down soon.